What’s it like working for TASTE in Nigeria right now? Well it is quite tough. 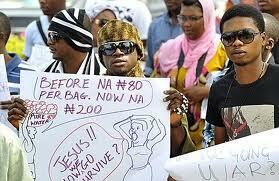 The government’s decision to remove the subsidy on petrol sent the price from N65 to N140 overnight. 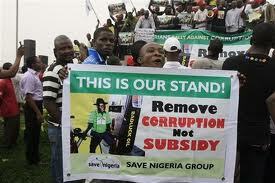 After days of general strikes when the country was effectively shut down, the government partially relented and removed some of the subsidy, so that fuel now costs N95 per litre. But, think about it, that is an increase of nearly 50% on petrol prices. How could you cope with an increase like that on your fuel bill? As you might have guessed the impact on the price of everything has been enormous. Add the genuine need to recover increases in fuel costs to the opportunistic increases to take advantage of the present uncertainty and you will find that some commodities, even bags of drinking water, have spiralled upwards in price! All travel costs have doubled and clients who were begging us to come and dig boreholes before Christmas have now told us that they are not spending money until they can see how the economic picture will pan out. The strikes and the uncertainty has effectively shut us down during January. It has been a tough month. And every other business has been affected in the same way. And what is the primary cause of all this unrest? Wherever you look, people quote different figues, but all are agreed that a small number of people have become hugely rich by ‘manipulating’ the fuel subsidy. Either businessmen are claiming to have sold more petrol than has been imported – and thus making huge amounts of money; or politicians and civil servants are saying that this is happening and taking the money themselves. Either way, corruption, on a massive scale is taking place. And the people know it. I wonder how long it will be before the Nigerian sesnse of optimism is replaced by a sense of realism? Perhaps, even, how long before the Arab Spring finds its way to West Africa. My fear then is that, unless God intervenes, those in power will respond as others have done further North and the country will run with blood. Much prayer is needed for Nigeria right now.